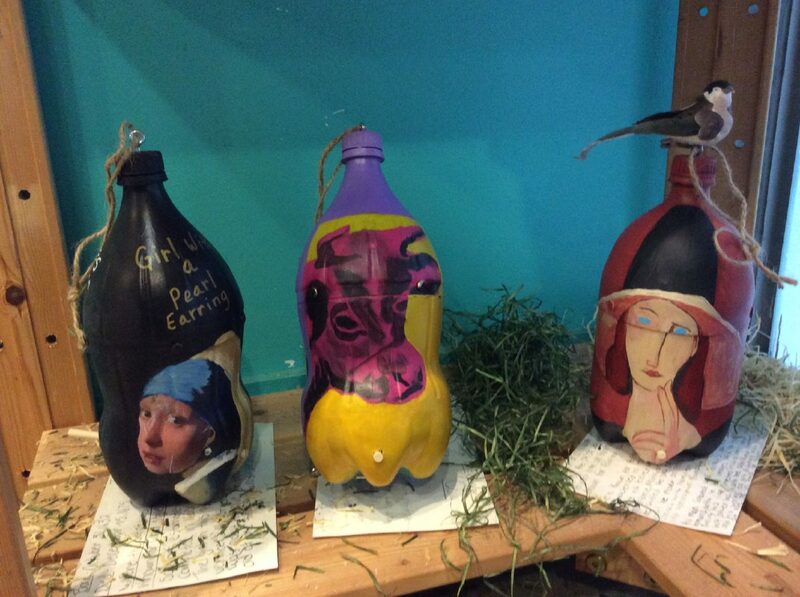 Student-painted bird houses are displayed at International Museum Art & Science in McAllen beginning Wednesday. Students at Donna ISD’s disciplinary alternative education program are learning the virtue of patience through art. Sonya Tijerina, art teacher at Donna ISD’s alternative school, is currently displaying painted bird houses her students created in an exhibit at the International Museum of Art & Science in McAllen. Tijerina, a former English teacher, had an itch to do something different, so she took up teaching art to students in the alternative education program at the beginning of the 2017-18 school year. “I don’t have children, so when I see these kids, I really feel for them,” Tijerina said. 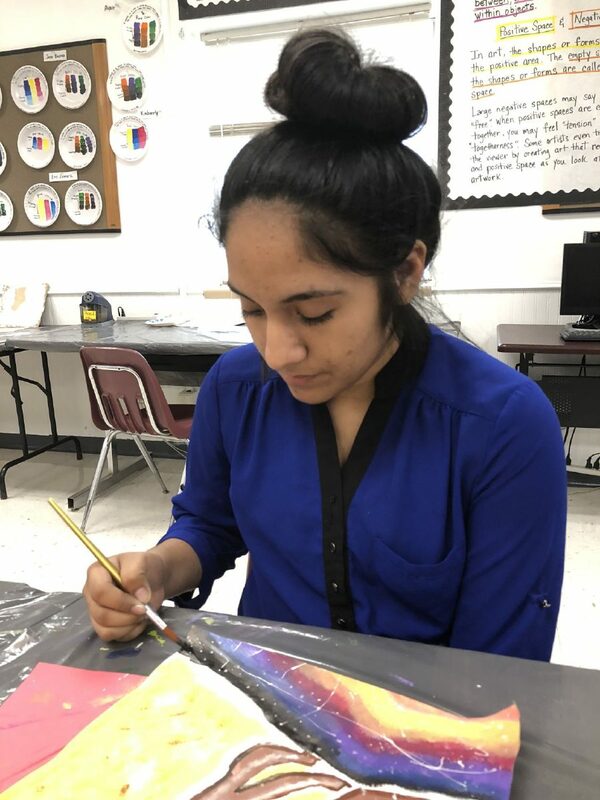 Eulalia Herrera, 15, paints in her art class Wednesday at Donna ISD's disciplinary alternative education program. Under Texas law, students who violate the district’s code of conduct may be removed from a classroom at their home campus and placed in a disciplinary alternative education program. Students can be sent to the alternative school to be disciplined for a variety of reasons including fighting at their home campus. Juan Mendoza, principal at the alternative school, got the idea to start an art class on campus from a friend of his who’s also a principal at an alternative campus in the Pharr-San Juan-Alamo school district. Eulalia Herrera, a freshman at Donna North High school, was placed in the alternative program after a physical fight at her home campus. At first, she wasn’t excited to emulate Wassily Kandinsky, an abstract painter born in Moscow. Once she got going, the process became gratifying. Respect isn’t the only lesson at the alternative campus. She said learning patience through painting has translated to being more compassionate and understanding in the real world. “When I paint, it makes me feel happy,” Herrera said. The campus not only has an art class but an earth club — the first student organization on campus that is geared toward middle school students. They donate funds generated through selling their recycling projects to sea turtle conservation efforts. Mendoza hopes to eventually expand the science department into gardening and composting, something not currently seen at the alternative school. Though Herrera will be leaving the campus in the near future after completing the 30 days required at the school, she still plans to continue painting. Painting, which she tried for the first time this school year, helps her cope with difficulties from time to time. “She, to me, is a cocoon that’s going to blossom into a butterfly,” Mendoza said.